Ok, so two things. Firstly, it’s really hard to take a photo of skincare that is even remotely interesting. Secondly, I really love cleansers. The more the merrier I say. Within cleansers I also have a penchant for the creamy ones – ones that moisturise, clean and leave skin feeling amazing. For the driest of skins the Origins pure cream cleanser is seriously impressive. It smells amazing, like all Origins stuff, and is almost milky in texture. Not amazing at taking makeup off, but I use a lot as my second evening cleanse, and it helps to hydrate my skin. 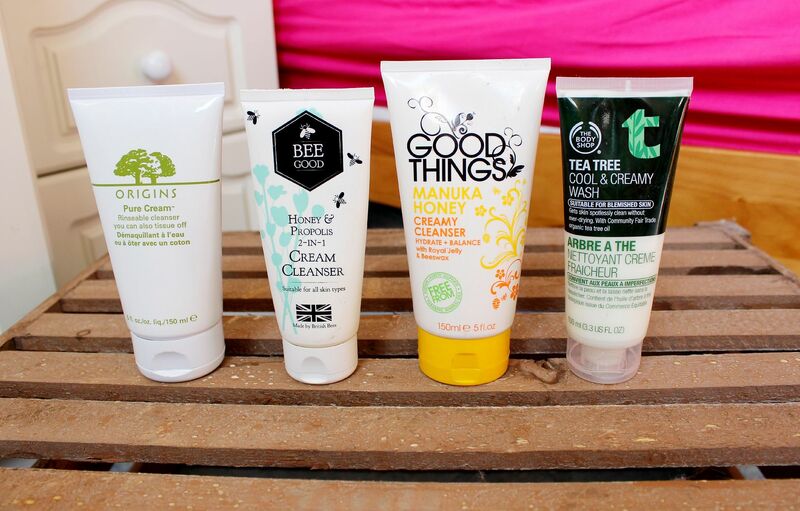 My favourite of the bunch though is the Bee Good honey & propolis cream cleanser. This stuff is legit. It takes makeup off, wakes my skin up in the morning, makes my skin feel so clean and soft but never dry… It also smells divine. I prefer this to the infamous Liz earle cleanse and polish! The Good things manuka honey creamy cleanser has a gel-like texture, and almost feels a little sticky on the skin. Manuka honey is supposed to be amazing, but I don’t love the texture of this… maybe too much honey? After washing off with a flannel though, skin looks brighter. The perfect one for oily or blemished skin is the Body shop tea tree cool and creamy wash. It applies like a thick white, mousse-y cream, and when you wash it off your skin feels tingly – incredibly clean, but not at all tight. Plus it’s only £5! My boyfriend likes this one too, and I think it’s amazing for hot summer evenings/mornings when you want your skin to feel fresh.